I am currently hooked on to books and Movies which have World War II as their central theme. 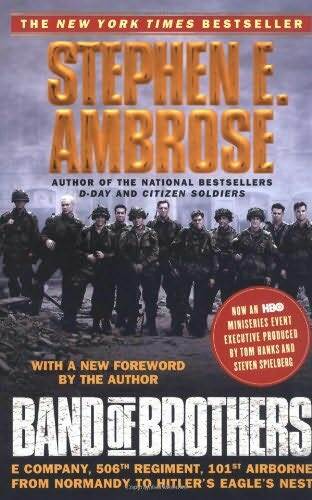 And when we talk about World War II, how can we forget the book 'Band of Brothers' written by Stephen Ambrose. The book is an International Bestseller in which the author pays tribute to the men of Easy Company, a rifle company which is part of the 506th Parachute Regiment , 101st Airborne Division of U.S. Army. Easy Company along with Dog, Fox and Battalion HQ companies made up the 2nd Battalion of the 506th Parachute Infantry Regiment. The book starts with the rigorous training of 140 men and seven officers at Camp Toccoa, Georgia who are part of the Easy Company in the summer of 1942. They came from all walks of life and all corners of the country. The book describes the intense training to toughen up the soldiers.What made their bond strong was a intense desire to kill Germans and do their country proud. By late spring of 1944 Easy Company had become an elite company of airborne light infantry. They saw their first combat action on early morning of D-DAY (Day when Allied forces landed on Normandy beach in France). The book covers the epic journey of this company from training in Georgia to the dangerous parachute jump on D-Day to the fierce Battle of Bastogne (a town in France) where the company came under heavy fire from Germans. Lying in the cold and freezing weather in the forest at Bastogne was the breaking point for the entire company. The sense of brotherhood in difficult times and to see your friends die under enemy fire was the toughest test which the company had to withstand. They lived and suppressed feelings which were always there, fear of dying, fear of wounds, fear of putting the lives of your men in danger. They saw their officers break down, strong men who were trained to lead. The Epic journey continues after capturing Bastogne onwards into Germany and finally to 'Hitler's Eagle's Nest' in Berchtesgarden. The Author has interviewed many survivors of Easy company and the entire book is filled with narrations from the soldiers. The entire story moves on the recollection of these men which is interspersed through out the book. The Author describes these soldiers as breathing, living humans with their prejudices and short comings. Though they come across as heroes, you can always see the frailty and human emotions which makes the book such a wonderful read. Stephen Ambrose has written a wonderful book, a piece of history which we all must read. He has given us the opportunity to peek into the life of soldiers and how life was during World War II. The sacrifices made by Easy company were tremendous and I salute them. For all those people who would rather see it than read the book, HBO has made the book into a 10 part mini series which is produced by Tom Hanks and Steven Spielberg. I saw the series first and then read the book. The series is a must see, it has been shot very realistically. You become a part of Easy Company and identify with the men. The series has followed the book to a T. Every part starts off with the surviving members of Easy Company describing the events in their own words and then series continues. A must see TV series for all the movie buffs and people who enjoy watching history unfold in front of their eyes. I am one of those who would rather see it..infact I have seen it and yes, there is no question about how brilliant it is. wow ! I am huge fan of war movies too :) I would try to catch soon the 10 part series :) would be great to see war movies in action! I am a big fan on WWII stuff and will def. put this book on my reading list..thanks for the awesome book review!! well researched review and i am sure watching the series on Tv must have helped conjure up the image. My father cwas a great fan of war movies and books and he too read voraciously, aboput thje World wars, theee Middle East crisis, [Exodus] and some films a great hit with him were Bridge o9n the River Kwai, Whr Eagles dare and ofcourse The Great Escape, which are but Classics. Wonderful review. Now, I am sure to see the series! Nice detailing in the post! vishal: oh cool...I agree it is brilliant. Lakshmi Rajan: do watch it and I guarantee you would not be disappointed. Savvy: Do see it once you get time. All the best for your exams. Tarun Mitra: You should read the book and then complete the series...it is definitely worth the effort. Sonal: Do catch the series...it is fantastic. Btw I have seen all those movies too..
Smita: Do read the book...I am sure you would love it. Mr. Stupid : hehe...Go and see the series..its wonderful. Karan: You will get a DVD of the series. A must watch surely. I am sucker for books but that sentence " who enjoy watching history unfold in front of their eyes" gives me a reason to watch the TV stuff too..
the HBO series you are talking about.....is it with the same name????? WOW!! I had not been very religious about blog-rolling you and some others...and what do I find?? I have missed a lot!! I love war stories....and lovved your review!! long time since i read a book. Put Tom Hanks or John Orloff in any movie/TV series, and I'm up for it. Though more of a movie person,than reading a book .. I have read this one, only to find out some faults with the series. Some inaccuracies did manage to get into the series, such as in the case of Albert Blithe. Blithe is a focal point of the third episode, which incorrectly states that he died in 1948. In fact, Blithe lived on to 1967, dying while on active duty in the Army. And btw have you read Parachute Infantry: An American Paratrooper's Memoir of D-Day .. let me know if you have, it has facts connected ! 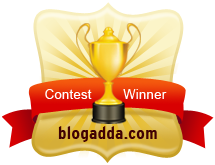 Kajori: Thanks :) I am glad you liked my review. Haddock: Watch the TV series if you are not into books. I haven't read that book...will try to find it in the library...thanks for letting me know. Sometimes all you can say is, WTF?